A tiny space camera has snapped amazing photos of theworld's first solar sail spacecraft to voyage into deep space on aninterplanetary mission for Japan. The solarsail vehicle, named Ikaros, took the opportunity for a self-portrait bydeploying a free-floating cylindrical camera just 2.4 inches (6 cm) in bothwidth and height. In the photos, the Ikaros sail shines like a gleaming silvership in a sea of black space. The spring-launched camera snapped the new photos of thesolar sail as the missiondeparts for Venus and beyond. Ikaros, short for Interplanetary Kite-craft Accelerated byRadiation Of the Sun, launched in late May and deployed its solar sail in earlyJune to become the first space mission ever propelledonly by sunlight. The mission was designed and built by the Japan AerospaceExploration Agency (JAXA). JAXA engineers will monitor the power generated by thin filmsolar cells embedded within the kite-like sail, in hopes that future missionscould combine solar sailing with electricity to power ion propulsion engines. Like the tale of Icarus, which tells the story of a boy whoflew too close to the sun, the Ikaros solar sail is also expected to exploreour nearest star. It is headed to the other side of the sun after a detour toVenus, JAXA officials said. "Through these activities, we will ultimately aim atacquiring navigation technology through the solar sail," JAXA officialssaid in a statement last Friday. 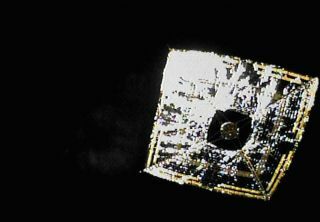 The solar sail mission piggybacked aboard the main launch ofJapan's Venusclimate orbiter, called Akatsuki ("Dawn" in Japanese). Both spacecraft launched alongside four small satellites onMay 20 (early morning local Japan time on May 21) from the Tanegashima SpaceCenter on Tanegashima island in Japan.